﻿ PORTWELL ANNOUNCES NANO-6062 WITH INTEL® ATOM™ PROCESSOR E3900 PRODUCT FAMILY (CODENAMED APOLLO LAKE)- Portwell, Inc. The NANO-6062, designed with Apollo Lake Intel Atom processor E3900 series, features one DDR3L 1600/1833 MT/s SODIMM socket equipped with up to 8GB DDR3L memory. It also integrates Intel graphics supporting DirectX 12, OpenGL 4.2, OpenCL 2.0 plus high-performance, flexible hardware decoding to decode multiple high-resolution 4K videos in parallel. In addition, it supports up to 4096x2160 pixels with DisplayPort, 1920x1200 pixels with VGA, and dual channel LVDS up to 1920x1200 pixels, and is designed with the flexibility for connecting up to three independent display interfaces. Support for four USB 3.0 ports ensures fast data transmission with low-power consumption. One 5 Gb/s PCI Express 2.0 lane can be used as 1x full-size mini-PCIe. Two SATA 3.0 interfaces with up to 6 Gb/s (one of them available as mSATA and the other for SATA) allow quick and flexible system expansions. Intel I210-IT Gigabit Ethernet controllers provide dual Gigabit Ethernet LAN access via the two RJ45 ports. At Portwell, we strive for excellence and the NANO-6062 is merely one example of the multitude of superior products designed and manufactured at our facilities. We challenge ourselves constantly to understand our customers' unique business needs and are committed to meeting their demands. NANO-6062 build with Intel® Atom™ processor E3900 series. Not only does it operates with TDP under 12W for fan-less applications, but it also supports industrial temperature range from -40°C to 85°C and wide voltage of power input from 12V to 24V. Support for four USB 3.0 ports ensures fast data transmission with low-power consumption. Two SATA 3.0 interfaces with up to 6 Gb/s (one of them available as mSATA and the other for SATA) allow quick and flexible system expansions. Intel I210-IT Gigabit Ethernet controllers provide dual Gigabit Ethernet LAN access via the two RJ45 ports. 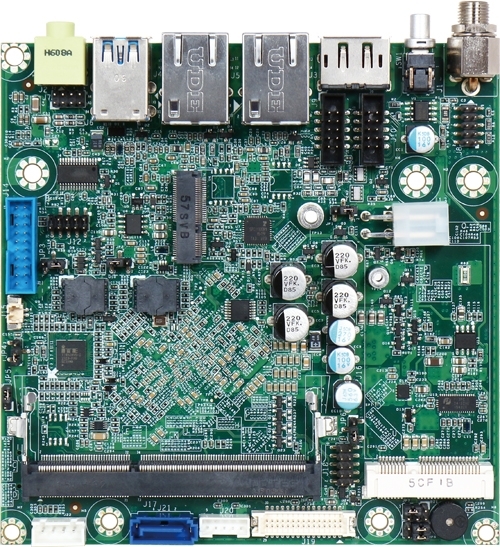 NANO-6062 can design their own unique systems for Medical, Networking, Panel PC, Kiosk and Digital Signage applications.